Experience the same waters enjoyed by Presidents and other legendary American figures at some of our hotels, inns, and resorts. For more than 170+ years, the Grand Hotel Golf Resort & Spa has served guests with true Southern hospitality. With a great tradition steeped in both society and the military, this luxury Alabama hotel overlooking Mobile Bay, was originally built in 1847 and had just 40 rooms on two floors. Over time it has served as a military hospital as well as an Air Force training facility. Hotel Captain Cook features 546 guestrooms, 4 on-site restaurants, a 24-hour business center, 14 different meeting spaces, and lobby shops. Bright Angel Lodge, a member of Historic Hotels of America since 2012, was built in 1935, has a natural, rustic character, and is listed in the National Register of Historic Places. It was designed by famed architect Mary E J Colter. 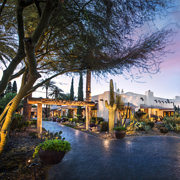 The Wigwam is one of Arizona's original iconic hotels. Originally built by the Goodyear Tire & Rubber Company to house sales executives in the early 1900s the resort evolved as a popular tourist destination when executives convinced their company president, Paul Litchfield (and original descendant of The Mayflower), to expand the small lodge into a winter retreat. When you step through the doors of the Hotel San Carlos, you experience the touch of a glamorous past and the affluence of a decade of romantic Hollywood stars. Throughout the years, Hotel San Carlos has been a refuge for famous guests including Mae West, Jean Harlow, Clark Gable, Ingrid Bergman, Spencer Tracy, Marilyn Monroe, and Humphrey Bogart. Royal Palms Resort and Spa is a romantic hideaway with the rustic splendor of a Mediterranean villa. Its 119 casitas and guestrooms serve as an oasis for guests seeking tranquility and solitude. Set in the Valley of the Sun, the hotel is located in the beautiful Phoenix-Scottsdale resort community, with the majestic Camelback Mountain providing a striking visual backdrop. Hotel Valley Ho was cool back in 1956 when it first opened its doors, before Downtown Scottsdale was downtown. It's every bit a chic hotel now, after an expansive, but meticulously groomed, $80 million 2005 renovation. Julia Morgan, renowned as the architect of the Hearst Castle at San Simeon, was also the architect of the Berkeley City Club, also known as her jewel, "the little castle". Built in eleven months, this six-story landmark opened in 1930 as the "Berkeley Women's City Club" with a membership of over 4,500. Boasting luxury accommodations, America's first full-service spa, and championship golf courses, Omni La Costa Resort & Spa is a historic retreat affording a true Southern California ambiance and picturesque natural landscape. A living legend for 130 years, Hotel del Coronado celebrates its rich history as a proud host to celebrities, royalty, and beach-loving families through timeless experiences that resonate with modern-day guests. Rated one of the top ten hotels in the world by USA Today, The Del offers a contemporary beachfront experience, ocean view dining, an award-winning spa, upscale shopping, and a variety of recreational activities. The Inn at Death Valley was built by the Pacific Coast Borax Company of Twenty Mule Team fame as a means to save their newly built Death Valley Railroad. A premiere Northern California hotel, the Benbow Inn is in the heart of Redwood Country, near the Avenue of the Giants, offering superb luxury accommodations, refined dining serving regional cuisine and an award-winning wine list, and beautiful meeting and event spaces. Overlooking La Jolla Cove and the sky blue Pacific Ocean, it's easy to see how La Valencia Hotel took its inspiration from Mediterranean resorts. Walk toward "the Jewel of La Jolla," as La Valencia is known, and you pass the colonnade flanking the palm-shaded patio before entering the historic lobby. The luxury accommodations at the Hollywood Roosevelt combine contemporary aspects, upscale amenities, and vintage Hollywood glamour. Fabulous spa, legendary golf course, luxurious retreat from the world: whatever your definition, the Ojai Valley Inn is a favorite among many. The 220-acre Ojai Valley Inn features 305 rooms and suites, four excellent restaurants, a golf clubhouse, and a Spanish Colonial conference center. Occupying an entire city block, The Mission Inn Hotel & Spa is a destination in and of itself. This remarkable property took more than 30 years to complete and combines design elements from throughout the Southwestern United States, particularly the California mission style, as well as several Mediterranean countries. The Palace Hotel, a Luxury Collection Hotel in San Francisco, was built in 1875 and was reputedly the largest, most luxurious and costly hotel in the world. On October 2, 1875, the Palace Hotel officially opened to capture the hearts of the American public. The Palace Hotel quickly gained prominence among the traveling elite visiting San Francisco. The Huntington Hotel features one-of-a-kind accommodations with high technology and whimsical décor. Each of the 134 guestrooms, including three exclusive suites, features WiFi, an iPod® docking station, USB ports and electrical charging stations, and work desks. The award-winning Fairmont Miramar Hotel & Bungalows is the epitome of Southern California style, elegance, home-like comfort, and beach life. 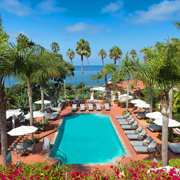 Serving the Santa Monica area since 1921, the Fairmont Miramar was once a mansion owned by former U.S. Senator John P. Jones, who is also the founder of Santa Monica. Listed on the National Register for Historic Places, the illustrious Hotel Casa del Mar harkens back to an era when the beaches surrounding Santa Monica were known affectionately as the “Gold Coast.” Founded in 1926 as Club Casa del Mar, the location was originally one of the city’s most luxurious beach resorts during the early 20th century. Set in the woodlands of southeastern Connecticut, The Spa at Norwich Inn is a premier resort situated on 42 landscaped acres of trees, perennial gardens, ponds, and an inviting, placid reflecting pool. For over 30 years, Water’s Edge Resort and Spa has kept its presence as a top New England beachfront resort for vacations and getaways. Originating from the vision of humanitarian Bill Hahn, the resort has jovial beginnings. With an obvious love for people and an appetite for fun, Hahn was dubbed the ‘host with the most,’ known for showing his guests a good time and providing a beachfront refuge from the hustle and bustle of city life. A true Washington institution, the Omni Shoreham has hosted inaugural balls for every president from FDR to Bill Clinton. To celebrate its ties to America's highest office, the hotel's nine presidential suites each bear the name of one of our great leaders. (Guests who express strong feelings may request to have the name plate on their suite changed. The historic Washington Hilton hotel boasts an optimal location in the vibrant nation's capital and features luxury accommodations, contemporary facilities, 110,000 square feet of event space, and a convenient starting point to explore Washington, DC. The story of the Belleview Inn begins with Henry Plant, a railroad and steamship entrepreneur in 19th century who realized that his passengers would need somewhere to stay. Plant built a grand, Queen Anne-style Victorian hotel that exuded Gilded Age grandeur in 1897. Book your stay today at Historic Hotels of America. Walking through The Gasparilla Inn's pillared entrance and into the lobby, you experience the feeling of Florida as it was meant to be. Guests are instantly embraced with the tranquil civility of a time that once was -- and still is -- at this classic resort. Casa Claridge's is one of the best-kept secrets of Miami's famous South Beach. Its grand Mediterranean architecture, unique interior atrium lobby, and ideal location across from the pristine waters of South Beach, together create the ultimate getaway spot. Enter a classic era of grace, elegance and style at National Hotel Miami Beach, an authentically restored Art Deco landmark that epitomizes the mood and decor of the 1940's, redefined with a modern panache. Designed by Roy France, one of the period's foremost architects, National Hotel was one of the grandest luxury hotels on Miami Beach when it opened in 1940. Overlooking the tranquil waters of Tampa Bay, Safety Harbor Resort and Spa is a one-of-a-kind destination rich in history and hailed for exquisite hospitality. 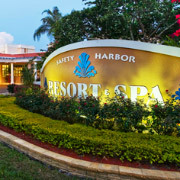 Tucked away in the quaint town of Safety Harbor aptly called “The Health Giving City”, the Safety Harbor Resort and Spa has remained a highly revered refuge for rest, relaxation and renewal for nearly 100 years. There's no mistaking the Don CeSar. Instantly known as Florida's Pink Castle when it opened back in 1928, this ten-story hotel sits on the sugary sands of St. Pete Beach, an island in the Gulf of Mexico. The Vinoy Renaissance St. Petersburg Resort & Golf Club is right out of the Florida of your mind. The salmon-colored Mediterranean Revival building opened in 1925 and has overlooked Tampa Bay ever since. The Greyfield Inn is a graceful colonial-style hotel on Georgia’s Cumberland Island, once the preserve of the Carnegies and other wealthy industrialists, and since 1972, a protected National Seashore. Built in 1900 for Margaret Ricketson, the daughter of Lucy and Thomas Carnegie and niece of Andrew Carnegie, Greyfield was opened to guests by Margaret’s daughter and her family in 1962 as a way of ensuring the property’s preservation. Located in one of the country's largest Historic Landmark Districts, The DeSoto is situated in the heart of Savannah's historic shopping, dining, and theater district, just a short stroll to the River Front and City Market. St. Simons Island is one of Georgia's Golden Isles, lying midway between Savannah, Georgia and Jacksonville, Florida. The islands are a popular resort playground, offering a mix of natural beauty, rich history and quaint charm, coupled with the allure of inviting year-round weather. The Grand Naniloa Hotel Hilo, a Doubletree by Hilton, has 320 fully-refurbished guestrooms and suites that provide upscale, contemporary lodging for vacationers exploring the charms of Hilo and nearby attractions, such as stunning waterfalls, Volcanoes National Park, snorkeling, and surfing off the beautiful bay and ocean coasts. As Waikiki's only true destination resort, Hilton Hawaiian Village® Waikiki Beach Resort offers the perfect mix of exceptional resort accommodations and classic Hawaiian hospitality. Originally developed by industrialist Henry J. Kaiser in 1955, this historic Honolulu hotel affords the widest stretch of white sand on Waikiki, a serene beachfront lagoon, lush tropical gardens and cascading waterfalls, majestic views of Diamond Head and romantic seaside sunsets. Opened in 1901, Moana Surfrider, A Westin Resort & Spa is situated in the heart of Waikiki Beach in Oahu and offers a true Hawaiian experience with the extravagance of elegant accommodations, unparalled hospitality, and superb amenities, defining the ultimate destination for a luxury Hawaiian vacation. The Mauna Kea Beach Hotel is an international destination resort, upholding a timeless tradition of luxury and aloha. Guest amenities at the 252-room resort include an award-winning 18-hole golf course, 11-court seaside tennis club, a beach club, island dining, homes, and villas. The 34-room Hawaiian hotel, Pioneer Inn, is located at the water's edge on Lahaina Harbor and features an outdoor pool and complimentary WiFi. Visitors who dine at the Grill & Bar can enjoy great views with their meals. Overlooking Grant Park and Lake Michigan, Hilton Chicago has served as one of the city’s most revered addresses since 1927. Meticulously redesigned and restored, this historic Beaux-Arts hotel offers 1,500 guestrooms and suites, exceptional dining options, a 16,450 square foot athletic club, and over 234,000 square feet of meeting and event space. Welcome to the InterContinental Chicago Magnificent Mile, one of the most beautiful landmark hotels in history. With its unique architecture and cultural diversity, it was originally built in 1929 as the Medinah Athletic Club, a luxury men's club for members of the Shrine organization. Unfortunately, in 1934 the club had been a victim of the stock market crash and was forced to close its doors. This 25-story Beaux Arts-style hotel is ideally situated within walking distance of Chicago's vibrant theater district, the Art Institute and famed Magnificent Mile, and within one mile of Lake Michigan. Remodeled in 2004, the Palmer House® a Hilton Hotel, boasts a two-story, gilded lobby with a formal staircase, marble-topped tables, velvet seating, and a ceiling mural depicting Greek mythology. Set in the prestigious Gold Coast neighborhood at the start of the Magnificent Mile, The Drake Hotel is a historic Chicago landmark featuring breathtaking views of Lake Michigan, 535 thoughtfully-appointed guestrooms and 74 suites, indulgent amenities, lavish ballrooms and event venues, and unparalleled service. Whether travelling for business or pleasure, guests at the historic 424-room Omni Severin Hotel will discover the convenience of a prime downtown location and the luxury of a elegantly updated classic hotel. In the heart of the downtown Wholesale District, the hotel is ideally located where you'll find the the biggest names and the brightest attractions the city has to offer. After more than $70 million in renovations, the former Heidelberg Hotel has been reborn as Hilton Baton Rouge Capitol Center Hotel. Adjacent to the Shaw Center and River Center Convention Center, it is less than five minutes from the Louisiana State Capitol and only three miles from Louisiana State University. Dating back to 1907, the historic Southern Hotel is situated in Covington, Louisiana, just 45 minutes north of New Orleans. Boasting architectural and historic integrity, the hotel offers 42 thoughtfully-appointed guestrooms and suites, a 2,400 sq ft ballroom, additional fitness rooms, spa services, an upscale bar, refined farm-to-table restaurant, and unparalleled hospitality and service. The intimate yet elegant Bienville House, a historic hotel in New Orleans, caters to tourists and corporate travelers alike. The hotel calls to mind a stately French Quarter manor house, with decorative wrought iron balconies and a gracious flagstone courtyard. NOPSI Hotel, a Salamander Hotel, features 217 guestrooms and suites, an on-site restaurant, a rooftop pool and bar, and 14,000 square feet of indoor and outdoor meeting space. The Omni Royal Orleans is a proud part of history on its legendary site. From the 1830's onward, this single block of the French Quarter has witnessed all that was and is New Orleans. From creole hedonisa to the austerity of the civil war, reconstruction, a sad decline to the rebirth in the modern world. The South’s most magnificent remaining antebellum mansion, Nottoway Plantation splendidly overlooks the Great Mississippi River, and continues to entice visitors, from near and far, to take a step back in time to the days of glory and grandeur. With a natural backdrop of colorful gardens and two hundred-year-old oaks, Nottoway is the ultimate blend of Southern history and hospitality, and an exceptional choice. The Colony Hotel is spectacularly situated amid glorious and manicured gardens on a rocky promontory above the Atlantic Ocean. The white wooden structure was built in 1914 and spans a full 300 feet, topped by a cupola and the weather vane of a large ship. The wrap-around Ocean Porch and the gazebo offer views of the ocean and river. Surrounded by sparkling waters and boasting brilliant views of Casco Bay, The Westin Portland Harborview offers luxurious accommodations and thoughtful amenities. Situated in the vibrant Arts District of Portland, Maine, The Westin Portland Harborview boasts 289 elegant guestrooms and suites, rooftop bar Top of the East Lounge, refined Congress Squared Restaurant, a full-service Akari Spa, dynamic meeting and function venues, and gracious hospitality. The former home of a naval officer, the historic Inn at Perry Cabin is situated on waterfront of the Miles River by the Chesapeake Bay. Built in 1816, the Inn was designed by Commodore Oliver Hazard Perry’s aide-de-camp, Samuel Hambleton. The stately Greek Revival manor in picturesque St. Michaels beckons to those who seek the small town charm and colonial history of Maryland’s Eastern Shore. Over 120 years ago, since its opening in 1891, Harbor View Hotel has been nicknamed the “Grand Dame” of Martha’s Vineyard and introduced a new era for Edgartown and Martha’s Vineyard. With an extraordinary view of Edgartown Harbor from the historic hotel's broad veranda, Harbor View became a summer haven for wealthy New Yorkers visiting the Vineyard. In the late 1990s the forgotten mill town of North Adams became a haven for technology companies and was infused with new life. Sparked by the visionary efforts of the Massachusetts Museum of Contemporary Art (MASS MoCA), which has renovated parts of a sprawling mill complex, the Porches Inn represents a new twist on hospitality. At the tip of Cape Cod's distinctive tip sits the eclectic village of Provincetown, home to the Crowne Pointe Historic Inn & Spa. Originally established a bustling seaport, Provincetown was once inhabited by a rowdy mix of smugglers, outlaws and raucous mariners. Since 1773, The Red Lion Inn has been welcoming travelers to the beauty of the Berkshires with traditional New England hospitality. The inn has hosted five presidents and numerous other notable figures, including Nathaniel Hawthorne, William Cullen Bryant and Henry Wadsworth Longfellow. Affording an elegant old world charm with the luxury and sophistication of modern day, Amway Grand Plaza Hotel began as the distinguished Pantlind Hotel in 1913. An integral part of the renaissance of Western Michigan, Amway Grand Plaza Hotel, with the historic wing and new Glass Tower, is located in the heart of downtown Grand Rapids contributing to the growing skyline of the business and entertainment district. The old-world elegance of Grand Hotel envelops you the moment you step onto Mackinac Island and board a horse-drawn carriage taxi or stroll the short distance to the hotel. Either way, your passage will be peaceful; cars aren't allowed on Mackinac Island -- one of the many traditions that still reign from the opening days of Grand Hotel back in 1887. Often dubbed America's all-natural theme park, Mackinac Island has escaped many of the trappings of the last century. Disembarking on the island is truly like stepping back in time. Motor traffic is prohibited on the island, so walking, biking, and horse and buggy are the preferred modes of transportation. Guests at the historic Island House Hotel enjoy stepping back in time. Since 1915, Many Glacier Hotel has offered a unique, one-of-a-kind experience to explore the magnificent landscape of Glacier National Park, Montana. Situated on the shores of Swiftcurrent Lake the hotel is comprised of five-story, Swiss-style chalets offering 215 guestrooms that exude a Swiss-alpine ambiance. The Bedford Village Inn offers 14 elegantly decorated guest suites. Not one room is alike and each both meticulously and beautifully decorated. The restaurant is a very short walk to breakfast on the Porch Dining Room, lunch in the Patio surrounded by gardens, and an elegant dinner in your choice of three very unique restaurants, the Tavern, Corks Wine Bar, or Dining Room. Eagle Mountain House & Golf Club exemplifies New England. Its century-old history ties the historic hotel to the region's heritage while seamlessly offering all the high-end amenities of any modern hotel alongside pristine, panoramic views of New Hampshire's White Mountains. The "Grand Dame of the Sea" -- as Wentworth by the Sea is affectionately known -- has set the model for coastline New Hampshire accommodations for over a century. When it opened in 1874, Wentworth was the largest wooden structure on the state's coast, a hub for social, business and political luminaries from around the world. On a rainy night in 1865, a group of travelers en route to Montreal was stranded when their stagecoach hit a muddy rut and overturned. Despite the late hour, they found a warm welcome at the nearby Dodge farmhouse and were so captivated by the hospitality of their hosts and the spectacular surroundings that they prolonged their stay. La Fonda is a Santa Fe landmark, just steps away from history and art museums, a variety of galleries and shops, historic churches and, of course, the Plaza. The historic inn's Pueblo-style architecture features thick wood beams, latilla ceilings, and carved corbels. Situated in the unspoiled Adirondack Mountains, The Sagamore Resort opened in 1883 and was a social center for the wealthy visiting Lake George. After closing in 1981, the hotel was reopened a few years later and restored to its original grandeur. Today the resort offers a wealth of recreational and dining opportunities for guests who enjoy "roughing it" with an elegance in the woods. It is not hard to imagine the finger lake region of frontier days when you stay at The Otesaga Resort Hotel. Otesaga, named for the Iroquois word for " A Place of Meetings," is located on the southern shore of Lake Otsego in Cooperstown, New York, and ranks as one of America's original grand lakeside hotels. For nine decades, the Hotel Saranac, Curio Collection by Hilton has been the centerpiece and constant cultural and social hub of the idyllic Adirondack village. Adventurers have historically come to seek out this magical village, not only as a place for rest and recuperations, but also as a basecamp for further adventures of their own making. Perched high atop a bluff overlooking the meandering Hudson River Valley, sits the Castle Hotel & Spa - a quiet contrast to the hectic pace of the Big Apple. This impressive structure replicates the Norman architecture of medieval Europe with a massive stone facade and imposing towers and turrets—an unlikely vision to behold in upstate New York, just 30 minutes north of Manhattan. The Omni Grove Park Inn is one of the South’s best-loved resorts. Built in 1913 with granite stones mined from Sunset Mountain, the resort overlooks the city of Asheville, N.C., and provides majestic views of the Blue Ridge Mountains. With its distinctive undulating red clay tile roof and original Roycroft furnishings and fixtures, The Grove Park Inn captures the essence of the Arts and Crafts movement. The Hilton Cincinnati Netherland Plaza is a true French Art Deco hotel masterpiece. Opened in 1931, the hotel was an integral part of the first multi-use complex in the United States. Described as a "city within a city," the complex featured an office tower, hotel, fully automated garage, shopping complex, and restaurants. An architectural gem atop a natural wonder, Timberline Lodge is an acclaimed ski lodge and mountain retreat on the south slope of Mt. Hood, standing 6,000 feet above sea level. Inviting a gracious warmth, Timberline Lodge is a historic luxury hotel featuring comfortable guestrooms and suites, refined and sustainable dining, a world-class ski and snowboarding facility, thoughtfully-appointed event spaces, and, most of all, distinguished hospitality. Today, the Buccaneer is the Virgin Island’s longest running resort, but its beginnings were anything but luxurious. In it’s turbulent past, St Croix has been under the control of the French, Dutch, English, Spanish, Danish and Americans, all influences which have enriched the island’s culture. The area’s first building was erected in 1653 by Charles Martel, a Knight of Malta, and was hidden from the sight of roving pirates and marauders who plundered the seas off the island. Located just outside the limits of the town of Bedford Springs, this sprawling 2,200 acre resort has been welcoming guests and making history for more than 200 years. Its red brick façade is distinguished by white columns, a porte cochere and a series of additions that amble their way up the hillside. The result is a charming combination of old and new elements that work in harmony against the rocky hills of south central Pennsylvania. Gettysburg Hotel has a tradition of hospitality that dates to 1797, when James Scott first opened his tavern. In the summer of 1863, the hotel played witness to one of the seminal events in American history as Union and Confederate troops swarmed over the small town of Gettysburg during a pivotal and bloody three-day battle. President Lincoln honed the immortal words of his Gettysburg Address at the Wills House, just steps away from the hotel. Silver Birches is home to a collection of thirteen vintage structures with varied histories, dating back to the 1920s. The choices for lodging are broken down into three categories: guestrooms, cottages, and houses. All buildings face the nearly 700 feet of shoreline on Lake Wallenpaupack and offer views of the lake. After returning from a trip to Europe, chocolate king Milton S. Hershey dreamed of building an elegant hotel on a hilltop overlooking the town that bore his surname. In 1933 that dream became a reality. Today The Hotel Hershey offers a magnificent mix of European splendor set amid 300 panoramic acres of picturesque countryside that reflects the vision of its founder. A beacon of sophistication, design, and society, the hotel has hosted royalty, world leaders, cultural icons, and history-making events throughout its 114-year history. Featuring 172 guestrooms, 30,000 square feet of meeting and event space, the hotel underwent a multi-million dollar renovation in 2016. It is currently managed by Hyatt as The Bellevue Hotel. The placement of the Skytop Lodge at the base of West Mountain in the Pennsylvania Pocono Mountains is perhaps the best indication that this grand resort has always been inextricably linked to its natural surroundings-and the 30 miles of hiking trails weaving through the 5,500-acre site merely reinforces that fact. From the alluring island of Puerto Rico and the vibrant city of San Juan, the Caribe Hilton is a AAA Four Diamond award-winning beach resort where ordinary ceases to exist and paradise never ends. Featuring a secluded beach, oceanfront swimming pools, nine restaurants, a full-service spa, and 65,000 sq ft of meeting space, the historic Caribe Hilton boasts the ultimate Caribbean experience. Since its inception in 1919, the historic Condado Vanderbilt Hotel has catered to sophisticated San Juan travelers who place one aspiration above all else – to pursue a lifestyle of five-star luxury and leisure within some of the world’s most exclusive destinations. Discover Puerto Rico as it is meant to be experienced at the Condado Vanderbilt Hotel where exacting service, luxury accommodations, exquisite amenities, and fine dining are a hallmark of every stay. Hamlet's proclamation to Ophelia, “Get thee to a nunnery” implies a certain negativity, but Puerto Rico is legions away from Denmark, and if the Bard had the good fortune to find himself on that Caribbean isle today, standing in front of the remarkable edifice of historic El Convento Hotel, he’d have surely penned something else. Situated between the Atlantic Ocean and Condado Lagoon, The Condado Plaza Hilton is a historic San Juan, Puerto Rico destination elevating the luxury accommodation, dining, meeting, and hospitality experience. On certain occasions, tragedy can inspire greatness. Such is the case of Rhode Island’s Newport Beach Hotel & Suites (formerly known as the Inn at Newport Beach.) A massive hurricane in 1938 wiped out the town’s numerous beach establishments. Two years later, after the sand settled, the Toppa family decided to build a new inn on the beach, positioning the property 100 feet from the rocks and the ocean’s crashing waves. Within walking distance from Newport Harbor the Hotel Viking is nestled in the Historic Hill district on famed Bellevue Avenue. Once the summering destination of America’s wealthiest, the Hotel was opened in 1926 to accommodate their haute monde guests. With the most recent multi-million dollar renovation finished in 2007 this hotel is the perfect choice for a historic stay in the heart of Upscale Historic Newport Rhode Island. From 1909 to 1970, all trains to points south passed through Chattanooga’s famous terminal, which was designed by a 24-year-old architectural student from New York. The terminal’s first plans were modified at the behest of the president of the Southern Railway System to emulate the National Park Bank of New York. The Statler has 159 guestrooms and suites, 219 private apartment residences on the upper 11 floors, a state-of-the-art concert venue, meeting facilities including a 14,500 square foot ballroom, four dining outlets, and retail and office space. As the epi-center of southeastern downtown Dallas, The Statler bridges the Central Business District, Farmers Market, the Arts District, and Deep Ellum. Ideally nestled along the historic River Walk in downtown San Antonio, the Omni La Mansión del Rio is where history comes alive. The Texas Historical Commission and the San Antonio Conservation Society have designated Omni La Mansión del Rio as a historical treasure. The historic hotel includes 338 comfortably appointed guest rooms and suites, the award-winning Las Canarias restaurant and its Texas Hill Country-infused menu, flexible meeting and event space and unparalleled service standards. Located adjacent to the Alamo, the original Menger Hotel was constructed on the site of Menger′s brewery, the first brewery in Texas. Opening on February 1, 1859, "the finest hotel west of the Mississippi River" was host to such notables as Sam Houston, Generals Lee and Grant and Presidents McKinley, Taft and Eisenhower—Teddy Roosevelt even recruited the Rough Riders in the Menger Bar. The name "Zion" means a place of peace and refuge. As a sanctuary with over 146,000 acres of cliffs, canyons, diverse plant and animal life, and uninterrupted beauty, Zion National Park is well-named. Its massive sandstone walls, some as high as 3,800 feet, offer an opportunity for serenity and reflection for all who visit. The Green Mountains of Vermont offer year-round delights. Tucked amid the picturesque countryside, the landmark Castle Hill Resort and Spa combines gracious hospitality with a scenic setting and modern amenities. When Ardelia Beach, founder of the landmark Basin Harbor, first came to Vermont to establish a working farm that would take in summer boarders anxious to escape urban living, she could not have chosen a better locale. Unofficially described as Vermont’s West Coast, Lake Champlain is the sixth-largest lake in America, with more than 600 miles of shoreline bordering its 120-mile length. Originally built in 1832 as a private residence by a Virginia General, The Martha Washington Hotel & Spa has seen many different uses. From a private residence, it evolved into a finishing school for young ladies. When the armies of the Civil War battled in and around Abingdon, the building served as a hospital for wounded soldiers, and romantic stories of nurses and soldiers still endure to this day. After the Civil War, The Martha became a women's college, and today it is an elegant hotel, paying homage to its gracious Southern roots and enduring historic legacy. In a city as steeped in history as Charlottesville, Virginia—home to U.S. presidents, witness of the ravages of the Civil War, and the burgeoning Virginia wine industry—it’s a significant achievement for an inn to rise in prominence. The remarkable 573-acre Boar’s Head Inn compliments the fresh Blue Ridge Mountain air and stunning scenery with gracious hospitality, gourmet cuisine, and a sense of the past that doesn’t sacrifice a single modern amenity. When Charles Dana Gibson and Irene Langhorne--better known as the Gibson Girl--hosted their engagement party on Halloween 1895, little did they know that their nuptial celebration would be the first in a long legacy of events at Richmond’s most revered hotel, The Jefferson. It opened that All Hollow’s Eve over 100 years ago, and from that moment it was a sight to behold. Listed on the National Register of Historic Places, The Hotel Roanoke & Conference Center, Curio - A Collection by Hilton, encompasses a glorious history that began in 1882. With classic Tudor Revival architecture, luxury accommodations, and a sprawling convention center situated amid the Blue Ridge Mountains, Virginia guests visiting for business or leisure can bask in its distinctly Southern charm coupled with unparalleled hospitality. Nestled in Historic Downtown Staunton in the heart of the picturesque Shenandoah Valley, this 124-room hotel captures the spirit, history and charm of the old South. Originally built in 1924, the property underwent a complete top to bottom renovation in 2005 and has was lovingly restored to it's original grandeur. The Cavalier Virginia Beach, Autograph Collection re-opened its doors in 2018 after a multi-million dollar restoration. This newly reimagined property is the latest luxury class member of Marriott’s Autograph Collection. With nine decades of dedicated service and a pristine reputation for hosting the finest events, The Cavalier offers unparalleled accommodations for destination weddings, executive-level planning sessions and retreats, bespoke social events, and experiential group gatherings. Regarded among the world’s greatest inns, the Williamsburg is the crown jewel of the Colonial Williamsburg hotels, offering luxurious accommodations adjacent to the country’s most celebrated live interactive history museum. Renowned as the largest living history museum in the world, Colonial Williamsburg offers visitors a taste of 18th-century life through its architecture, costumed interpreters and historical reenactments. The Pfister is known as the “Jewel of Milwaukee,” a Victorian masterpiece located just three blocks from Lake Michigan. The hotel’s elegance is further enhanced by the tradition of “salve” a philosophy that embodies the spirit of fine hospitality and is brought to life by each member of the hotel’s staff. The Pfister is set apart from other downtown hotels by a number of distinguishing features, including an ornate three-story lobby flanked by a grand marble staircase at one end and a massive fireplace at the other. The accommodations in Yellowstone National Park aren't just places to stay, they are monuments to a long-standing ideal that special places in the world should be set aside and preserved for future generations. Staying in the park is the best way for visitors to experience all Yellowstone has to offer. On May 28, 1987, The Old Faithful Inn was designated by the U. S. Secretary of the Interior as a National Historic Landmark.